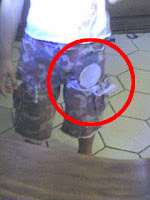 Duct Tape with Newspaper core (5"x4"x5.5"). 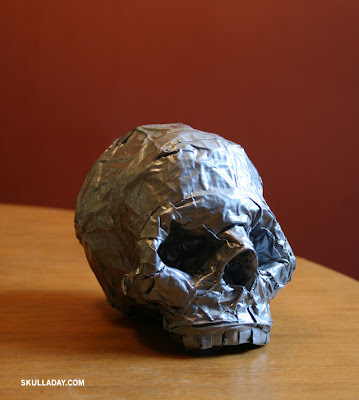 Yet another thing you can do with duct tape. 57. 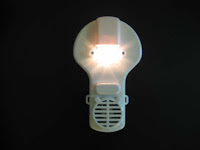 Plastic Skull Type 6 a.k.a. 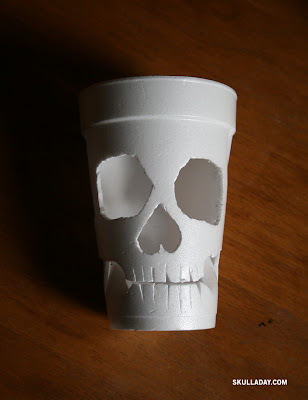 "Poly Styrene"
Cut cup made of type 6 plastic (Polystyrene) which is not recyclable in my hometown of Richmond, VA. I was disappointed to be given this cup as my water glass in the vegetarian restaurant where I ate lunch today, the only upside is that it has been recycled into a skull now. Face Paint on Skin. Thanks to Jessica for being a super awesome/patient model. 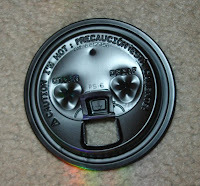 Vicky found this cute skull lurking on a coffee cup lid. Josh discovered this skull on his daughter's pants. Kira shared this copy of a lovely commissioned painting she made in 2000 and the sad story of how the original was burned up by the new owner in a fit of anger over the end of a relationship. "Alas! Poor Yorik!" indeed. Mariana took this nice picture in the Paris Catacombs (where I've been twice!). It contains between 5 and 6 million skeletons (arranged by bone!) and is a must see if you're not claustrophobic. 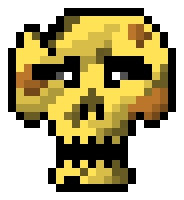 This awesome 8-bit skull was made by Heavy. Boris sports this neat stylized tattoo on his arm. Jennifer made this spiffy color theory project in art college. 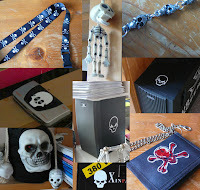 Jheelan shared this nice collection of skulls/skeletons. 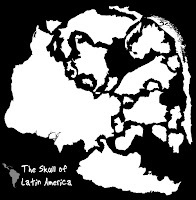 Danilo was inspired by the United Skull of America and United Skull of Europe to make the Skull of Latin America! 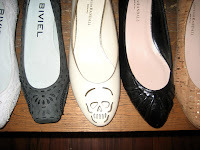 Jeff spotted these high-priced skull shoes in San Francisco. ...and in turn Matt made this cool autocross "skulmet"! 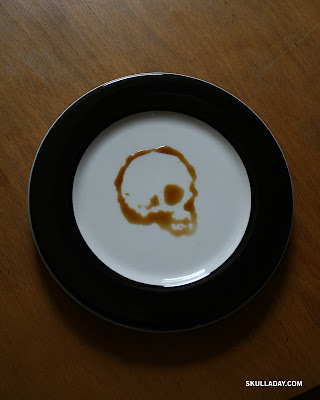 And Patrick was inspired by Skull-A-Day to make a "Top 10 Skull Tattoos" post on his excellent Inklusion blog! Thanks again everyone, it's so nice to know that my little project has inspired you in some way. 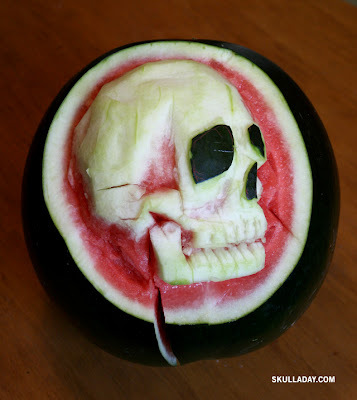 New submissions are always welcome at skull at skulladay.com. Wood burning tool on pine (approx. 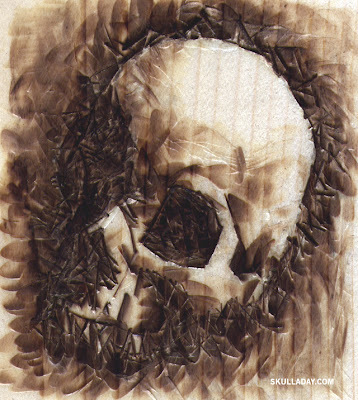 4"x4"). I haven't used a wood burning tool since my very brief stint as a Cub Scout. Carved bar of Soap. The last time I tried carving soap I was a teenager and I cut deeply into one of my fingers, I still have the scar. I was nervous that would happen again, but happily this one was injury free. Carved 10" organic watermelon (from my CSA!). Yes this will get eaten later today. Sponge cut with Xacto. I pretty much feel this way about house cleaning. 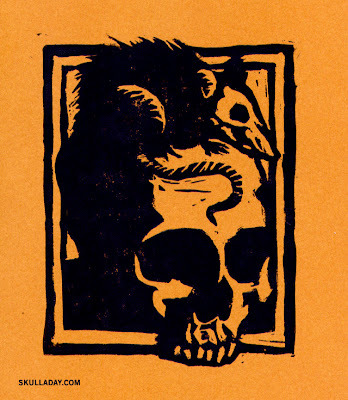 Linocut print (4"x5"). I can't believe I've never worked in this medium before. I must have missed that day in art class. 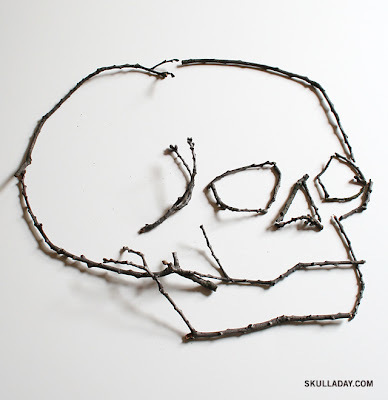 Adrianna, age 6, was inspired by Skull-A-Day to make this amazing skull. 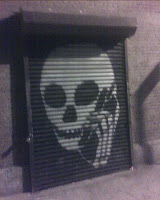 Christine spotted this guy in NYC (after also spotting one of my chalk skulls in person!). 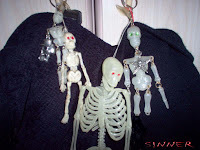 Yoman3d shared his personal collection of skulls. 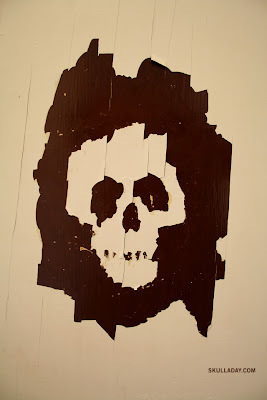 Rob found this unexpected skull in the scraps that remained from a piece of art he made. Justin was inspired by Skull-A-Day to make these cool skull drawer knobs. 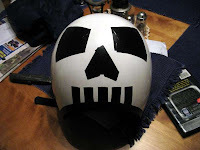 He also shared these decorated skulls he made a few years ago. My friend Sarah just excavated this Amerindian skull in Carriacou, Grenada. It's from between 300-1200CE. 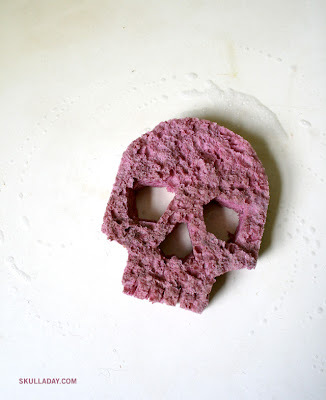 Brittany discovered this skull inside of a Playskool Gloworm. 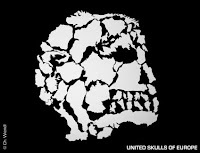 Christian was inspired by the United Skull of America to made this United Skull of Eurpoe. 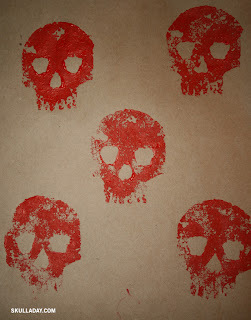 If you want to share your skulls, send 'em to skull AT skulladay.com. Arranged computer keys. What does L33T mean? Find out here noob. Arranged twigs (approx. 15" x 15"). There was a bad storm yesterday that knocked out the power for half of the day and also deposited these twigs (and more) in front of my house. Soy Sauce on Plate arranged with Chop Stick. A tricky medium as the liquid kept slowly moving towards the center of the plate. 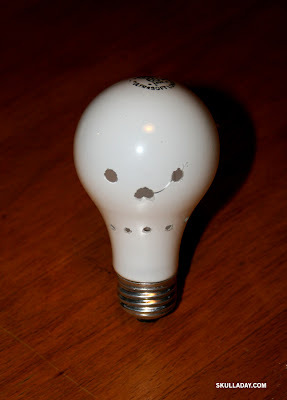 Holes drilled in light bulb. This was the only survivor of 8 attempts. Today's post is a special Crossover with the blog In The New. Details below. Ink on the Hand of Jen from In The New. Jen is doing a one-year daily project blog as well, in her case it's about doing something new every day for the year leading up to her 30th birthday. Since I was in her town we decided to meet up for lunch and do a crossover post (you know like when DC characters show up Marvel comics and vice-versa?). 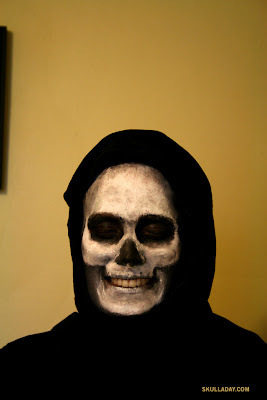 Her new thing was to help make a skull (link to her post) and I agreed to do something new, in this case using another person to create a skull. Thanks to Jen for being a patient model. 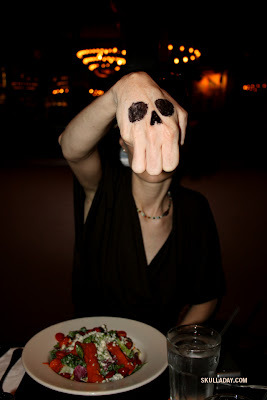 And special thanks to Brad for suggesting and demonstrating the hand skull to me. Chalk on sidewalk, various streets SOHO, NYC. 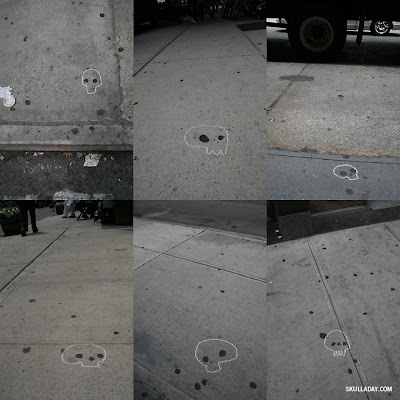 If the amount of black spots on the sidewalks is any evidence New Yorkers chew a lot of gum. 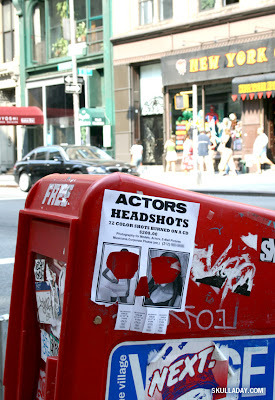 Modified flyer on newspaper box, Broadway below 14th St., NYC. I couldn't help myself those tear-offs just looked like teeth to me. 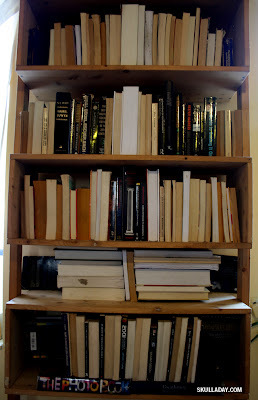 Arranged Books on Shelf. This is a friend's bookshelf in NYC, I wonder if he'll keep it this way. Chipped paint on door. I really need to finish renovating my house one day. P.S. 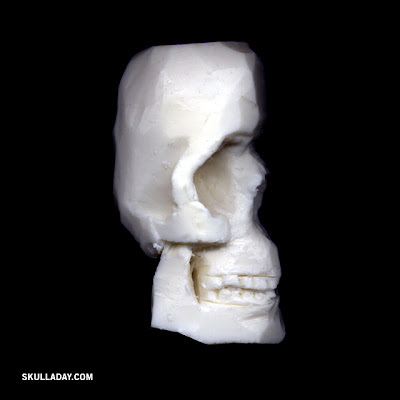 I'm going out of town for the next 4 days, but I'll still be making skulls while I'm a way. However, there's a chance I might not be able to post them every day, if that's the case I'll post them when I get back. We'll see. 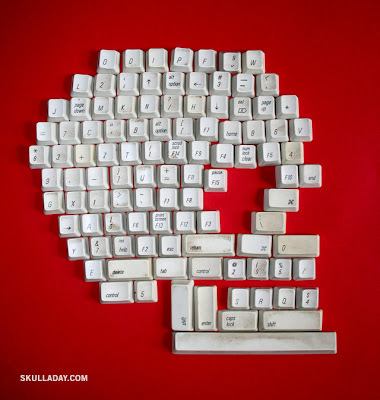 Heymaniac asks "Why Skulls? ": A. Why not! 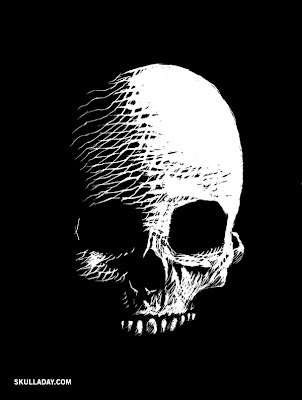 B. I've been pretty much obsessed with skull and skeleton imagery since I was a kid. C. They remind me of the brevity of life. D. All of The Above. 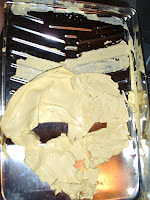 Michael found this creepy skull when cleaning out a paint tray (if you're wondering, the color is "chilled lemonade"). 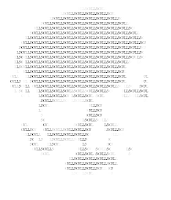 Kim made these lovely ASCII skulls using this site. 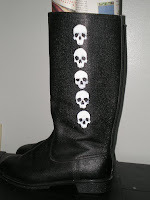 Xaq Fixx hand painted this boot. 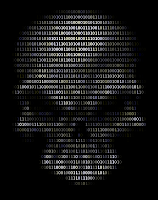 The mysterious "C" sent in this poster mash-up (I swear I really don't know who "C" is!). 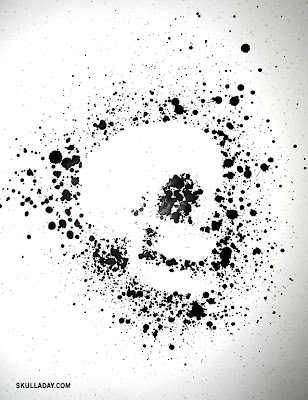 DaRkNeSS DeMoN used the skull stencil on a PC case! Andréa-Ja sent this photo all the way from Auckland New Zealand! 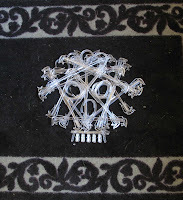 A suggestion from Grá, "Oh, you gotta make a rag-weave skull (like in a rag rug.)" 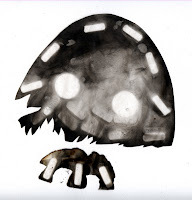 W (possibly Vincent) sent Origami Skull instructions! And of course thanks to everyone for linking here! Carved Bark (11" x 5"). 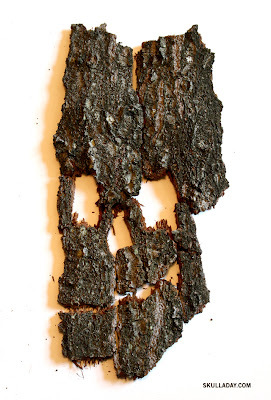 This piece of bark was waiting for me out front of my house this morning and was clearly crying out to be made into a skull. Don't listen to crying bark, it's not easy to carve. P.S. Thanks to everyone for all the great comments! I really appreciate the positive feedback and suggestions. I read them all, and while I don't have time to reply to each (and make skulls, and still work!) I will be following up on several of them soon. I'll also be making another "suggestion box" post in a couple of days with all the great submissions I've gotten, so stay tuned.